I know, I know - it's halfway through December, and I've designed an advent calendar. But I PROMISE it's never too late to start mine - it's the Random Acts of Kindness Advent Calendar! And it's never too late to start doing kind things...which means you should print this off, TODAY, and get started! 1. Download the PDF (link below) and print on heavy paper. 2. Cut out the gift tags (cutting out the hearts is optional, but I recommend it!). 3. Glue the numbered tags to the tags with text, so that when you flip them over, you can read the text. 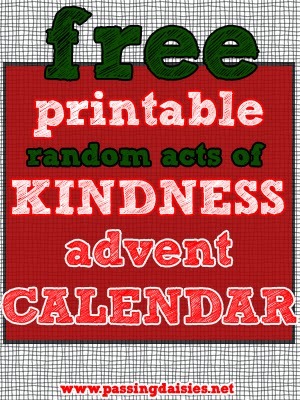 CLICK HERE to download the Random Acts of Kindness Advent Calendar! What other printables would you like to see?! I am unable to get the PDF from the link. It is not working. Do you mind sending me a copy, please?